We Move into Fall | Sprezzatura, Y'all! Fall has slowly been taking hold here for the past few weeks. The days are cooler and the evenings are downright chilly. You definitely need a jacket and socks. No more t-shirts and sandals after the sun goes down. No more aperol spritzes for our cocktails. It’s just too cool for something that light and refreshing. We’ve moved to red wine or scotch. Something to warm you up as it goes down. The food is changing too. The panzanella salads have been replaced by other things. Lasagnas, ribolittas, pappa al pomodoro, and things like that. And aquacotta. Acquacotta translates to cooked water. It is so much more than that. As with so many Italian dishes, this one has its origins in cucina povera, or the food of the poor. Poor people trying to feed themselves on the meager provisions they could find. The main ingredient is stale bread which is soaked in water. Then the recipes vary according to where it’s prepared and what is available to add to it. Around here, there is a particular preparation that yields something very unique. 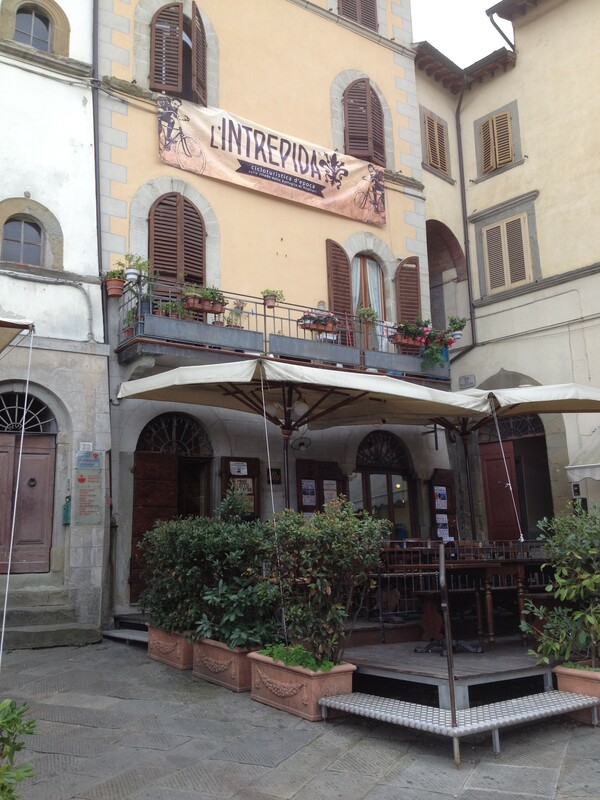 There is a restaurant in Anghiari called Al Cantuccio. They always have pizza and foccacio by the slice, but they also have unusual, and very uniquely Anghiarian, specials. Sometimes they have porchetta, sometimes panzanella, sometimes a crazy salad. Always on Friday they have fried fish. Except for the pizza and fish, you really never know what they will have. 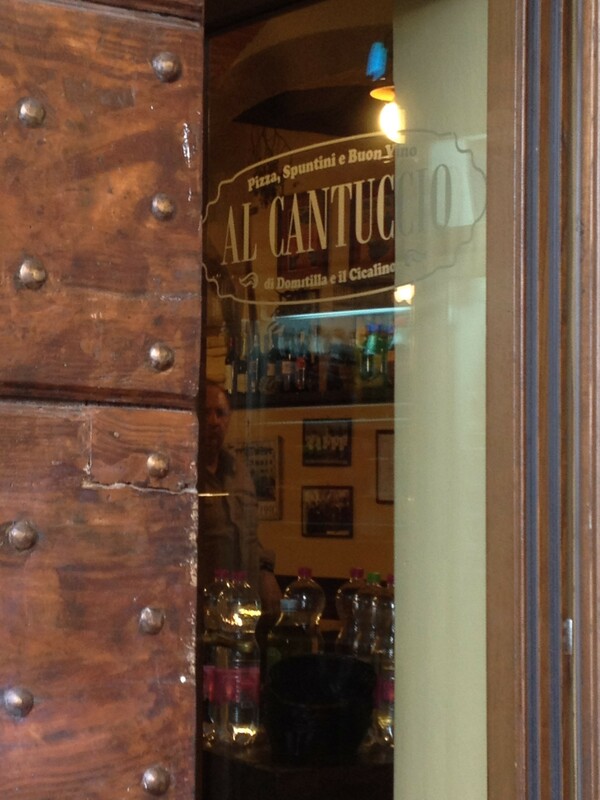 Al Cantuccio is owned and operated by Domitilla and Cicalino. It occupies a prime spot on the main piazza, Piazza Baldaccio. Domitilla and Cicalino live above the restaurant and they have a couple of people helping them, but mainly it’s just them everyday. It’s organized chaos in there most days. There’s no wait service – you just make your way up to the counter and see what they have and wait until Domitilla’s all-knowing gaze lands on you and then order. Sometimes you pay then, sometimes later. You hang out until your food is ready and take the plate to a table (inside or out) or get it portare via (to take away). And it’s always good. It’s very simple, very rustic, very local and very good. And I love that you can get just a slice of pizza. They always have a nice variety already made and they’ll heat it up for you in the big old wood burning oven in the back. They cook the pizza in big rectangular sheet pans and Domitilla cuts it with a mezzaluna into perfect portions. The pans have the marks of countless blades passing over them in the exact pattern of the slices. She knows where to put the knife without looking. Our friend Michelangelo told us about the acquacotta. We went the next day and got some. Some acquacotta is like a soup or a stew. That’s kind of what you would expect. But theirs is more like a thin casserole. A couple of layers of soft, spongy bread, soaked back to life and just moist enough to absorb all the flavors of the other ingredients. Onions, mushrooms, eggs. 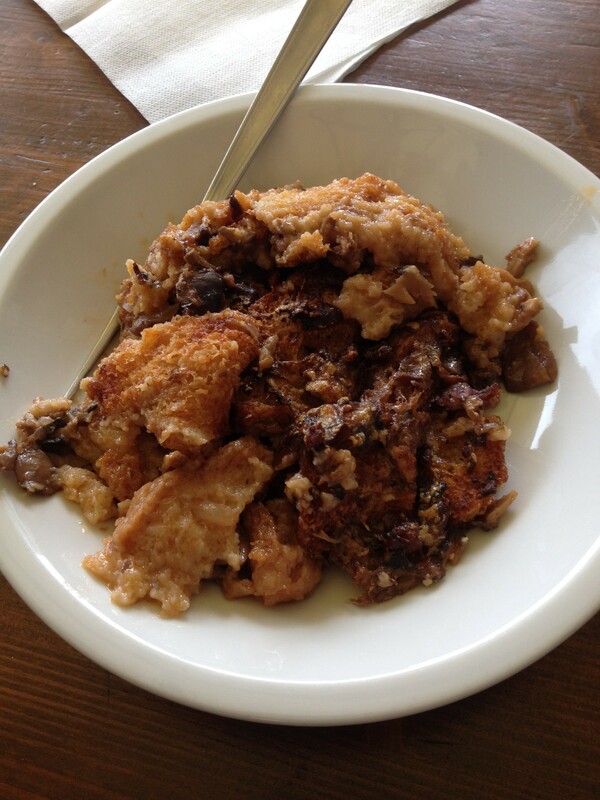 It’s delicious and does just what it was designed to do – fill up a poor, hungry stomach. Domitilla and Cicalino (which means little cicada in English – a nickname given to him by a family member) speak no English. We manage to communicate with our very limited Italian and a lot of pointing. Recently we were in and it wasn’t crowded. Cicalino was there by himself and asked where we were from. We told him we were from the United States, Atlanta, Georgia. He said “Oh, Ray Charles!” We’ve since found out that he is a musician and used to operate a music store in the space that now houses the restaurant. 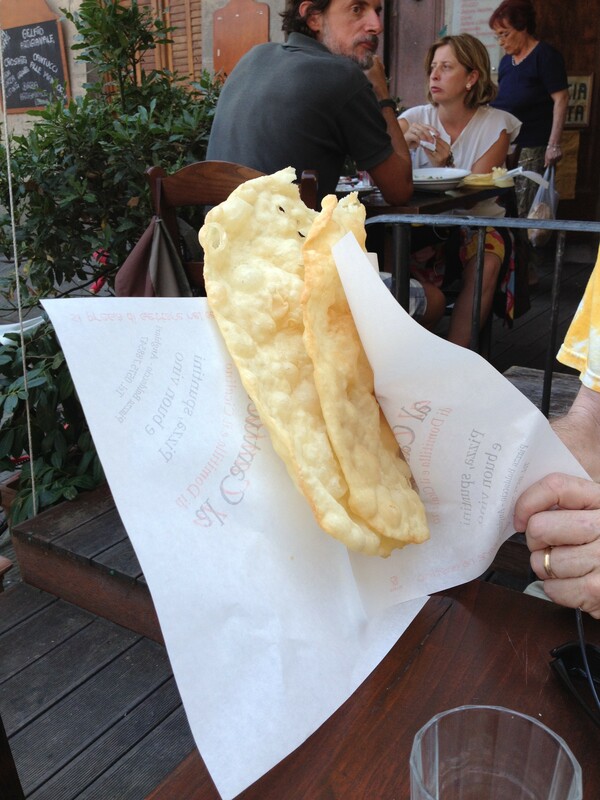 They also have ciaccia fritta, which is a fried flatbread. The flatbread is called ciaccia and is generally sliced and stuffed with all sorts of goodness – meats, cheeses, veggies. Kind of a little sandwich. The ciaccia is also baked in the hot wood oven and gets nice and blistery and is cut up into slices to serve with a meal. And evidently it is also fried. We had to have it. It’s good. For the life of us, we thought it tasted very much like a beignet. For one brief moment, we were in New Orleans at the Cafe du Monde with a plate of beignets. And this weekend – guess what? They’ve having a blessing of the Ciaccia Fritta in Fighille, right around the corner. You better believe we’ll be there. Gotta love fall.